Holli Andrews has departed Framingham. I helped her pack, and I was surprised at how envious I felt when I saw her boxing up the possessions she wants to keep, and ruthlessly tossing or donating the things she doesn’t; her packed car, ready to hit the road, looked like a ticket to fresher air and thrilling adventures. I’m inspired! With Holli gone, the sparkle level of Framingham has suffered a precipitous decline. 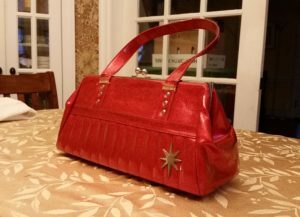 However, she has sparkle to spare, and she did leave a trace behind, in the form of this amazing purse, red glitter with a silver sunburst and leopard-print lining. I bravely resisted the siren call of her offers of nifty kitchen gadgets, an enormous and handsome ceramic flower pot, an array of bottles of useful household products…I even refrained from rummaging through her three huge boxes of books to donate. I’m quite proud of my restraint, actually. But when I saw this magnificent item headed to the thrift store, I was overcome. I plucked it from the donate box. So a trace of Holli’s sparkle remains here in the ‘Ham, at least until I follow her good example, ditch my superfluous stuff, and move on to the next adventure. Happy birthday, Holli, thank you, and gute Reise!